Plymouth Auction Rooms made a surprise find on a recent visit to a remote Cornish cottage on the banks of the river Tamar. The auction firm was valuing a mixture of Cornish art and collectables at the address when it came across a Pablo Picasso vase. 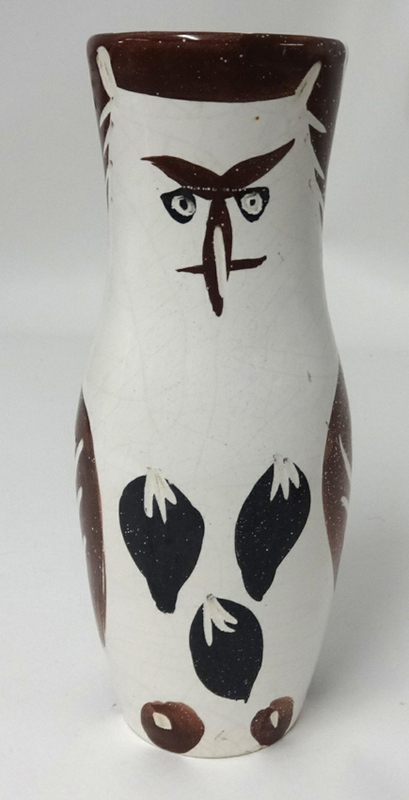 This chouetton (owl) vase by Pablo Picasso was found in a Cornish cottage and will auctioned in December at Plymouth Auctions Rooms with an estimate of £1000. He found an abstract painted vase which he said “shouted Picasso”. The vase has an impressed mark Edition Picasso Madoura on the base and is a chouetton (owl). The auction firm has identified it as part of Pablo Picasso’s (1881-1973) Plein Feu series produced at the Madoura pottery works in Vallauris in the south of France and an edition of 500 conceived in 1952. The vase measures 10.25in (26cm) and is painted and glazed on white earthenware. The vase carries an estimate of £1000 and will be offered at Plymouth Auction Rooms’ Christmas Antiques & Collectors Items sale on December 14.